If you think that it’s only men who can sport slicked back hairstyle, you’re absolutely wrong. Pushing back your hair and tucking it at the rear of the ear can give you an ultra cool look. It is mainly suitable for diamond faces as it helps the hair to stay back and flaunt the entire jaw line at the same time. This simple twist to your slicked back hair can give you a more girly look. All you need to do is to push back only one side of the hair. Keep the other side open and let people have a glimpse of your beautiful diamond. It is even better to create waves in your open locks or curl them up gracefully. Love short hair? Go for a bob of medium or chin length with or without layers. The best thing about this hairstyle is that it makes your jaw line look wider. Those who dislike their pointed chins should opt for chin-length bob as it gives that portion of the face a round appearance. 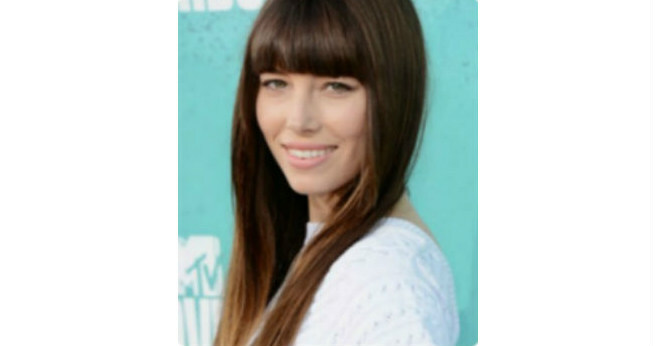 Straight bangs will never go well with your diamond-shaped face. Rather, choose to flaunt block bangs. As these are not that straight or heavy, you will get a soft round look in place of a long face and sharp chin. A long straight ponytail is a true delight for a diamond face. Just pull all your hair back and finish your hairdo by using a nice band. Your ponytail can sit anywhere (low, middle or high) on your head. In short, this is a wonderful choice for diamonds. Side-parting can seem to be a great challenge for diamond-faced girls like you due to the narrow hairline. But if you use a tail comb and part your hair diagonally from deep one side to the middle, it will turn out to be an excellent style. How can we miss those simple and elegant layers? Multiple layers falling by the side of your face will hide your wide and high cheekbones in a natural way, thereby giving you a narrower look. Even though super straight locks do not suit a diamond face that well, you can make your dream of having sleek and straight hair true by choosing this cut. Each of these hairstyles can balance the flaws of a diamond face and make it prettier. So, what is your choice?